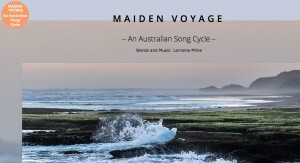 On Monday evening May the 23rd, the new resource kit to accompany Australian Composer, Lorraine Milne’s Song Cycle – Maiden Voyage was officially released at the Melbourne Graduate School of Education. Julie Montague (ex National President) created the accompanying resource kit for teachers to use and shared her expertise with a room full of engaged teachers. The realtime comments and insight of Lorraine Milne added to the fascinating exploration of her work and how this can be applied in the classroom setting. This afternoon workshop was followed by the official opening of the resource, which has been kindly supported and developed through joint funding from the the Melbourne Graduate School of Education (MSGE) and ASME. The Australian Music Centre (AMC) has also been instrumental in supporting the production and distribution of these kits. 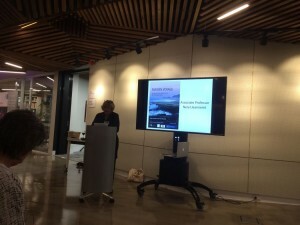 Associate Professor Neryl Jeanneret (ex National President) welcomed attendees to the fantastic new Arts space on Level 5, sharing some history of the work and the development of the resource itself. This was followed by comments from Lorraine Milne as composer then from Dr Brad Merrick, the current National President, who highlighted the need to keep supporting Australian Composers and integrating their work into the emerging Australian Curriculum. This resource will provide and excellent reference for study of Lorraine’s Song Cycle through the exploration of the range of composition devices and stylistic features used. ASME thanks Julie Montague for her work in the developing of such a diverse and useful resource for classroom teachers. Richard Gill’s Keynote Address from the 2015 National Conference! Fantastic new “Performance Anxiety Resource Booklet” created and available for teachers and musicians! Link for FREE download here.